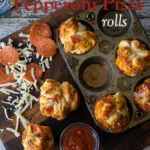 These Cheesy Pepperoni Pizza Rolls are a quick and easy recipe that is filled with mozzarella cheese and pepperoni in a fun pull-apart bread that you’re whole family will love! I’m pretty sure I need a pizza intervention. I never really thought I was obsessed with pizza until I took a long hard look at the amount of pizza recipes I’ve made. 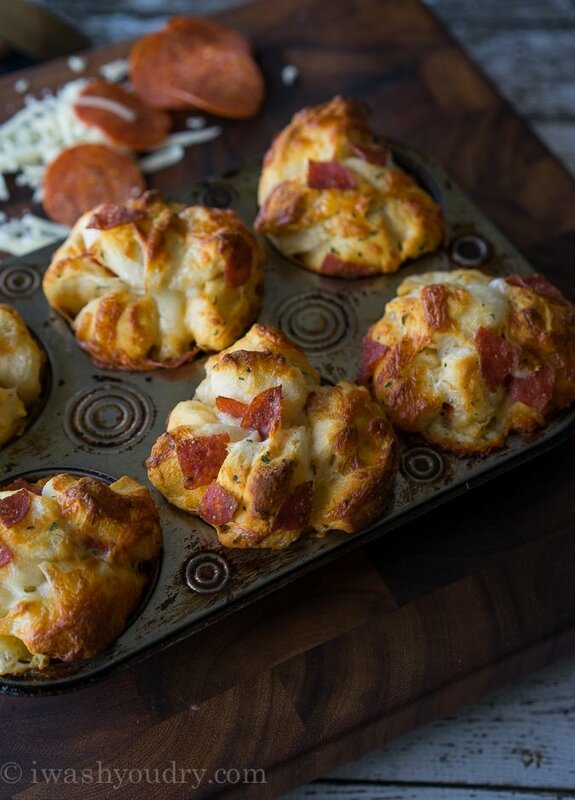 I feel like I should have known after The Pizza Cake… but these little rolls really took me over the top. These rolls are crazy easy to make too, which only adds to my addiction. 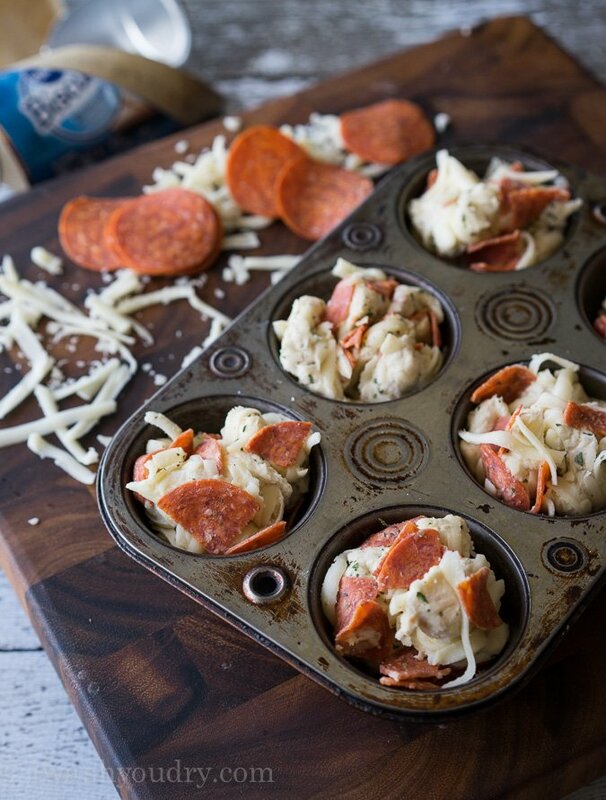 Just toss all the ingredients in a bowl then fill up the muffin tin with the pizza roll mixture. They’re done and ready to devour in less than 15 minutes! Can you blame me for having a pizza obsession? I mean… just look at these!! I won’t tell you how many I ate …it starts with a t and ends with a hree. 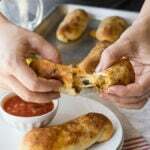 Just make sure you serve these with a side of warm marinara sauce. Or some ranch dressing. See you at pizza anonymous. 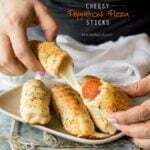 Cheesy Pepperoni Pizza Rolls are a quick and easy recipe filled with mozzarella cheese and pepperoni! Cut each of the biscuits into 4 equal pieces and place them in a large bowl. Pour in the melted butter, garlic powder, parsley, pepperoni pieces and mozzarella cheese. Toss to evenly combine. Divide the mixture among a lightly greased 12 muffin cups for medium sized rolls, or 9 muffin cups for larger rolls. Didn’t Pillsbury discontinue these biscuits (the ones that you can get in a 4-pack) in favor of the Grands that don’t really work with most recipes like this? I used to use them to make sausage biscuits with pre-cooked sausage links (kinda like pigs in a blanket) but the Grands didn’t work because the size and the texture was so different, and there was always one problem or another with every store brand that I tried. Hmm… I’m not sure! You can use the grands biscuits and just cut them into small pieces though! WOW! 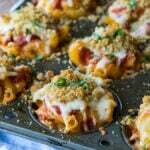 I made these tonight and all 3 kids AND my husband LOVED them. They devoured the whole pan and I had to make another.the kids have very different tastes so there’s usually always one who doesn’t care for a meal. But this was a huge hit. And it was so quick and easy. We put pepperoni in some and just cheese in others. Thanks for this great recipe. This is going straight to the top of the recipe book. Can you use other meat instead of pepperoni? If so how much? I kept telling myself there is no possible way these things are that good……then i tried one…..i doubled the recipe as there are 6 males plus myself in the house…..and I have to say….these things were definitely THAT good…and then some…I was soo full after 2 but wanted to keep eating….super easy and super yum. I will be making these atleast once but probably closer to twice a month. Oh, these look CRAZY GOOD. 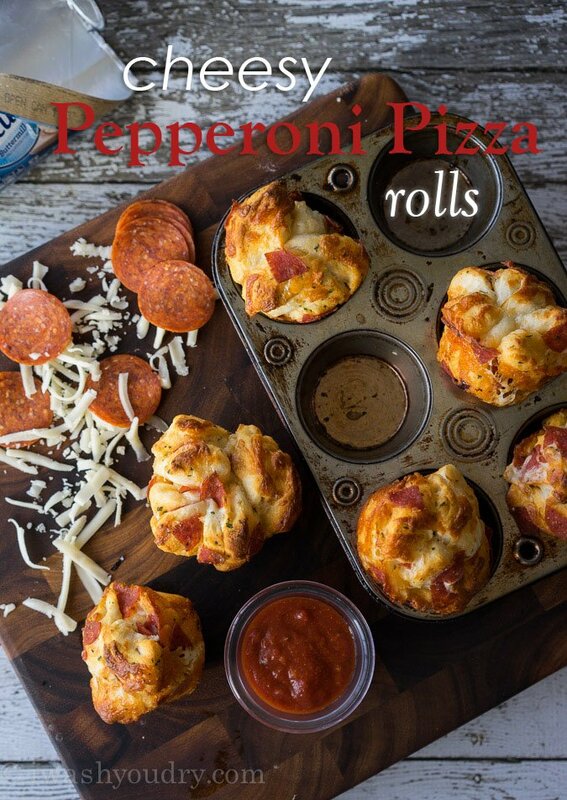 I’m a pizza fanatic and I love anything easy… I am totally making these! 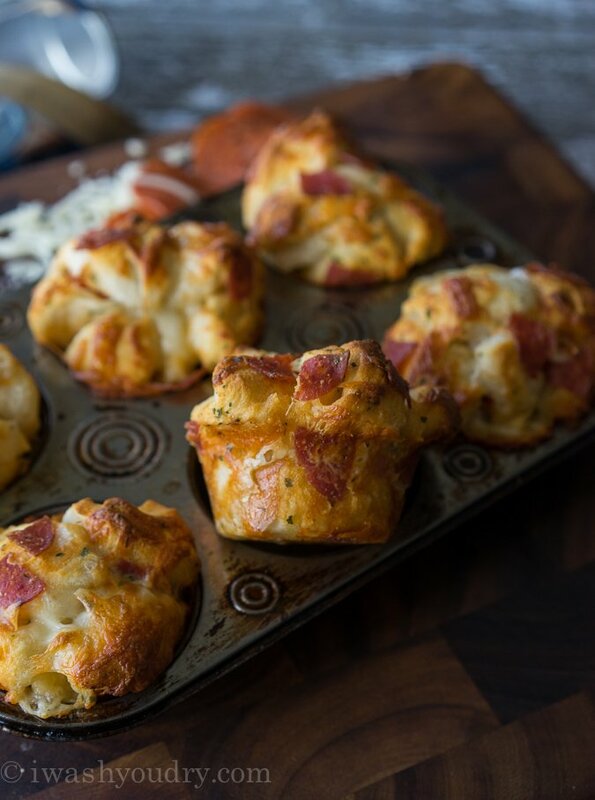 I can’t believe how quick and easy these are, they look like they’d be complicated to make…love this recipe! Wow – If I lived on an island and could only have one food – it would be pizza. So these are calling my name! Gorgeous and creative – love it! HMMMM!! Just wondering if a mini cupcake tin could be used, and served as an appetizer.. Thanks, can’t wait to make. Sue S.
Thank you for putting an ace up my sleeve. Score for Super Mom.